As we carry out St. Francis’ legacy, our priority is always to aid the poor. Our mission is to care for the poor via simple things such as providing shelter, building a place of worship, supporting friars and empowering others to assist in these life changing gifts. When you Join Our Cause you are helping a community that desperately needs your help. Please take this opportunity to help maximize our efforts and Join Our Cause. Franciscan bees at work. Taste it for yourself! 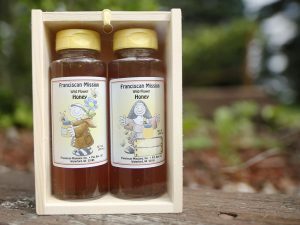 You get two 12 oz plastic bottles of our delicious honey. Delivered in a handmade wooden box with a Plexiglas cover, it makes a perfect gift for a loved one or a treat for yourself! 1. Follow in the Footsteps of St. Francis of Assissi and serve the poor by joining the Franciscan Missions monthly giving club!